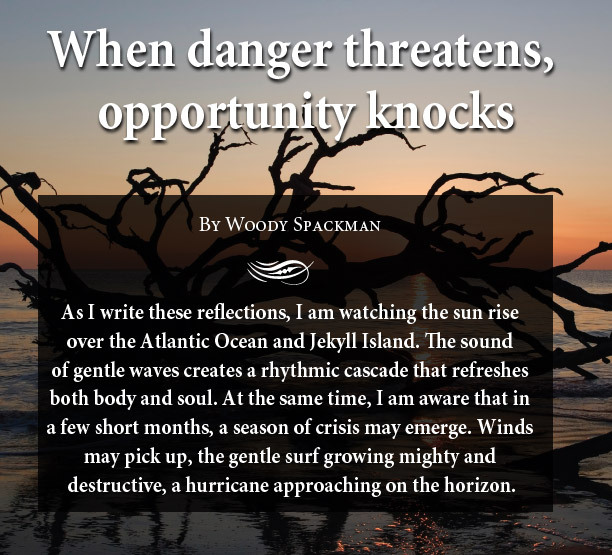 Just as the relaxing atmosphere of the barrier islands can change in a moment, so too can our lives when accident, stroke, or aneurism descend on us or on someone we love. Like a hurricane, sudden illness or accident inevitably presents a crisis for both patient and family. Hospitalization brings with it a loss of control as families are thrown into an environment with unknown equipment, strangers, different sights and smells. In this uncomfortable scenario, people confront mortality. Will they live or die? If they live, how will their quality of life be affected? The family system—shorn of regular habits and daily constructs—tilts. Long-held differences, conflicts, and fears emerge. The Chinese have written such an event into their language to remind us of the potential of the moment. In Chinese, the two characters representing crisis are ones that individually mean Danger and Opportunity. While we know the danger only too well, we often forget the opportunity. In the United States, the medical profession has established a routine way to handle illness and hospitalization. The hospital staff works closely with the patient to face the reality of recovery or to accept a permanent change. However, that same staff often relegates family members to roles of waiting or observing. Occasionally, they call on the family to make decisions for the patient, especially when the patient is unable to communicate. These decisions are often troubling—when to insert a feeding tube, when to remove life support, when to issue a do-not-resuscitate order. Understandably, the family feels ill-prepared to make such life-and-death decisions, in part because they have been isolated from the storm raging inside the closed unit. Despite the inadequacies of this system, we have grown used to it, and everyone plays their predictable roles. At Emory, change, like a second hurricane, is raging ashore in a new neuro ICU. In this high-tech, carefully designed unit, the concept of “family-centered” care is thrusting itself among the staff, patients, and families with all the fury and excitement of a storm. Ample internal waiting spaces and family suites in each patient room are moving families from occasional observers to active participants right in the eye of the hurricane. With barriers removed, families directly observe care being delivered by doctors and nurses, and they experience a new intimacy with the health care process. They even have a choice to observe invasive care when it is needed. These changes veer from normal patterns. Expectations are confused, in a sense ushering in a second crisis. Danger and opportunity emerge. Although patients improve faster with the presence of family, I wonder about the other dangers and opportunities that emerge in the midst of the storm. From a pastoral care perspective, I would like to suggest a few to watch and monitor. 1. Will the constant presence of family in the hospital suite enrich or strain the family relationships? 2. Will healing be celebrated differently when both the family and the patient experience the same processes? 3. What will happen to the trusting relationships between family and the medical team as the families observe the possibility of human error and the debate of appropriate treatment? 4. Will treatment, especially invasive treatment, increase awareness among families of the reality and futility of continuing life-saving measures when the patient is too far gone? Or, conversely, will the families’ front-row seats to the crisis reinforce denial and unrealistic hope? 5. Will the building of community between families grow, as it has in the past in a common waiting room, or will it decrease becaue of the separation of family units in individual suites? I don’t know the answers to these questions. I do know that we need to seek those answers. At Emory, we have a great opportunity to change how we give medical care with the family-centered approach and the new supporting facilities. However, it will take more than a new environment and approach to promote healing and enable coping. We must intentionally create a support network of pastoral care, social services, and patient advocacy as well as develop structured opportunities for families to share what they are experiencing, deeply and personally, for the first time. The Department of Pastoral Services has allocated the resources of pastoral care and staff to support just such an endeavor. I look forward to the opportunity of what we will experience, learn, and be able to do for individual patients, their families, and the medical experience in general. I am likewise aware of the danger of releasing the winds and rain of change. 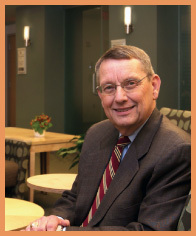 Woody Spackman, MDiv., is director of Pastoral Care at Emory Healthcare.